January 11, 2016 – New York – A new ALS treatment utilizing a stem cell infusion protocol performed at Hadassah Medical Organization (HMO) and developed by the US/Israeli biotech company BrainStorm Cell Therapeutics (NASDAQ: BCLI), has significantly slowed the progression of Amyotrophic Lateral Sclerosis (ALS, also known as Lou Gehrig’s Disease), announced Ellen Hershkin, National President of Hadassah, the Women’s Zionist Organization of America, Inc. (HWZOA). JAMA Neurology published the findings of the Phase 1/2 and Phase 2a ALS Clinical Trials conducted by Dr. Dimitrios Karussis, MD, PhD, Sr. Neurologist, HMO Neurology, in their 1/11/16 issue. These Clinical Trials, which began in 2011, utilized an innovative adult stem cell self-transplantation treatment involving the harvesting of stem cells from the patient’s bone marrow, their culture and enhancement using Brainstorm’s patented protocol NurOwn® and their injection into the patient’s cerebrospinal fluid by a technique that was developed and proposed by the Hadassah investigators. 26 ALS patients participated in the trials at HMO / Jerusalem, which is owned by HWZOA. HMO Principal Investigator Dr. Karussis explains the JAMA Neurology study findings: “The results are very encouraging. Close to 90% of patients who were injected intrathecally through the spinal cord fluid were regarded as responders to the treatment either in terms of their respiratory function or their motor disability. Almost all of the patients injected in this way showed less progression and some even improved in their respiratory functions or their motor functions. A Phase 2, double blind, study is running currently, at Mayo Clinic, Massachusetts General Hospital and University of Massachusetts Memorial Medical Center, using a treatment protocol identical to the HMO trial. The JAMA Neurology study also details NurOwn,® BrainStorm’s proprietary process for differentiation of autologous Mesenchymal Stem Cells (MSC) into NeuroTrophic Factor (NTF)-secreting cells (MSC-NTF), and their transplantation back into the ALS patient at or near the site of damage. These specialized adult stem cells, derived from the patient’s own bone marrow, deliver nerve growth factors directly into the affected tissue sites in order to enhance the growth and function of the nerve cells. The ability to induce differentiation of autologous adult Mesenchymal Stem Cells into MSC-NTF cells is unique to NurOwn® making it the first-of-its-kind treatment for treating neurodegenerative diseases. The activity and potency of these stem cells is validated before transplantation. NurOwn® received Orphan Drug Designation from the U.S. Food and Drug Administration (FDA) in February, 2011, and from the European Commission in July 2013. In October, 2014 Brainstorm was granted Fast Track designation for NurOwn® by the FDA. A 2011 study determined that BrainStorm’s self-transplantation approach has a high safety profile, with no risk of rejection and no need for treatment with immunosuppressive agents which can cause severe and/or long-term side effects. Hadassah International supports the Hadassah Medical Center’s two hospitals, the world-renowned trauma center and the leading research facility in Jerusalem. Hadassah supports the delivery of exemplary patient care to over a million people every year. The Hadassah Medical Organization serves without regard to race, religion or nationality and earned a Nobel Peace Prize Nomination in 2005 for building “bridges to peace” through equality in medical treatment. 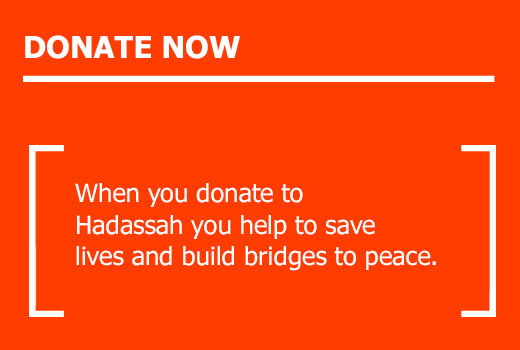 For more information, visit www.hadassahinternational.org. For the article in German, please click here. For the article in French, please click here. For the article in Spanish, please click here. To see some of the Media Coverage of Hadassah’s Successful ALS Trials and Treatment Protocol click here. Below is the video of Prof. Karussis and Chaim Lebovits of Brainstorm making the announcement at a press conference.